Source: CICH graphic created using data adapted from First Nations Information Governance Centre, Our Data, Our Stories, Our Future: The National Report of the First Nations Regional Early Childhood, Education and Employment Survey. 2016. http://fnigc.ca/sites/default/files/docs/fnigc_fnreees_national_report_2016_en_final_28072016_0.pdf -accessed August 25, 2017. 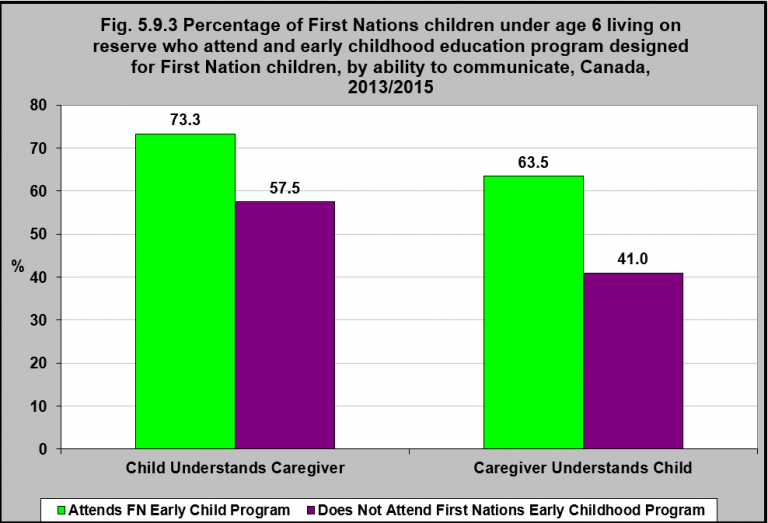 In 2013/2015, 73.3% of primary caregivers of First Nations children under 6 years of age living on reserve who reported their child attended an early childhood program designed for First Nations children (such as the Aboriginal Head Start* On Reserve Program) reported that their child understood them all the time when they spoke. This compared to 57.5% for children who did not attend an early childhood program designed for First Nations children. Similarly, 63.5% of First Nations primary caregivers living on reserve whose children attended an early childhood program designed for First Nations, reported they could understand their children when they spoke compared to 41% for children who did not attend a First Nation specific program. 1First Nations Regional Longitudinal Health Survey (RHS) 2008/10, National report on adults, youth and children living in First Nations Communities. https://fnigc.ca/sites/default/files/docs/first_nations_regional_health_survey_rhs_2008-10_-_national_report.pdf -accessed August 15, 2017. As early childhood is an important stage for the development of a positive sense of cultural identity, self-esteem and self-worth, learning about one’s culture and language in early childhood is important for providing a foundation on which this positive identity can be built.1 Indigenous led early childhood programs build strong foundations centred on the child while involving parents as the child’s first and most influential teacher. The programs cultivate positive self-worth, a desire for learning and opportunities to succeed. It is therefore important that early childhood education programs promote Indigenous cultures and languages. When such programs are designed by Indigenous people for Indigenous people, they are culturally relevant and incorporate the cultural and linguistic components needed to foster Indigenous children’s cognitive and linguistic development.2 These approaches improve the potential for equity for Indigenous young children and improve outcomes for Indigenous peoples over the long term.3 A number of such programs exist and have had a positive effect on school readiness; language, social, and motor development and academic skills; cultural literacy, and exposure to Indigenous languages. 2See for example, Morcom, A., & Roy, S. (2017). Learning through language: Academic success in an Indigenous language immersion kindergarten. Journal of American Indian Education, 56(2), 57-80; Fontaine, S. (2012). First Nations languages and improving student outcomes. Ottawa, ON: Assembly of First Nations.